What would be a good chauffeured hire car service without a panel of services and options on board ? CAMARGUE VTC Premium offers a Platinum service (included in our prices) in order to guarantee a pleasant trip and professional no matter if this is just a transfert from / to an airport or a car with chauffeur at disposal for several hours. 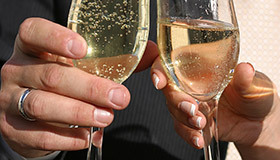 For all evening outings (restaurant, nightclub, gala…), in couple or with friends, to avoid the traffic jam and hassle to find a car park or loss of points for your driver license, in addition of the usual service, we will offer you a bottle of champagne 37/cl served on board for 2 passengers. (valid for a return trip home to point B fixed, arranged at the time of the bookingi).